Steady weight gain is one of the signs that your baby is healthy and feeding well. It's normal for babies to lose some weight in the first few days after birth. 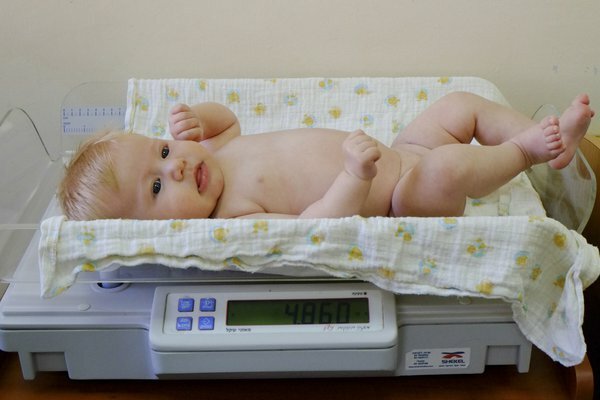 Your baby will be weighed during their first two weeks to make sure they're regaining their birthweight. Four out of five babies are at, or above, their birth weight by two weeks. Your midwife or health visitor will support you if your baby loses a large amount of weight or doesn't regain their birthweight by two weeks. They'll talk to you about how feeding is going, possibly ask to observe a feed if you're breastfeeding, and look at your baby's health in general. Your baby will usually only be weighed more often than this if you ask for it or if there are concerns about their health or growth. You can go your local baby clinic to see your health visitor at any time. There's no need to wait until your baby needs to be weighed. Your baby's length may also be measured at some of their developmental reviews. Your child's growth will be recorded on centile charts in their personal child health record (PCHR), or red book. These charts show the pattern of growth healthy children usually follow, whether they're breastfed or formula fed, or having a mixture of both. Visit the Royal College of Paediatrics and Child Health website to see some examples of baby weight charts. Boys and girls have different charts because boys tend to be a little heavier and taller, and their growth pattern is slightly different. The curved lines on the charts are called centile lines. These show the average weight and height gain for babies of different ages. Your baby's weight and height may not follow a centile line exactly. Their measurements may go up or down by one centile line, but it's less common for them to cross two centile lines. If this happens, talk to your health visitor, who can advise you. It's normal for your baby to be on different centiles for weight and length, but the two are usually fairly similar. All babies are different, and your baby's growth chart won't look exactly the same as another baby's, even their own brother or sister. Your child's height after the age of two gives some indication of how tall they will be when they grow up. If you like, you can use the adult height predictor in your baby's red book to work it out. Once your child gets to the age of two, your health visitor may use their weight and height to calculate their body mass index (BMI) and plot it on a centile chart. This is a way of checking whether your child's weight is in the healthy range or not. If they're overweight or underweight, your health visitor can give you advice about your child's diet and physical activity levels. You can also use our BMI calculator to check your child's BMI (as long as they are two years old or over). For more information about your baby or toddler's weight or height, talk to your health visitor or GP.